A Travers la Voilette by Isabey: launched in 1925. The name means "Through the Veil" and the veil theme was repeated on the presentation box and bottle shown below. The name has erroneously appeared as "A Travers la Violette". So what does it smell like? I have no notes on this composition, I would need a sample to tell you what it smells like? 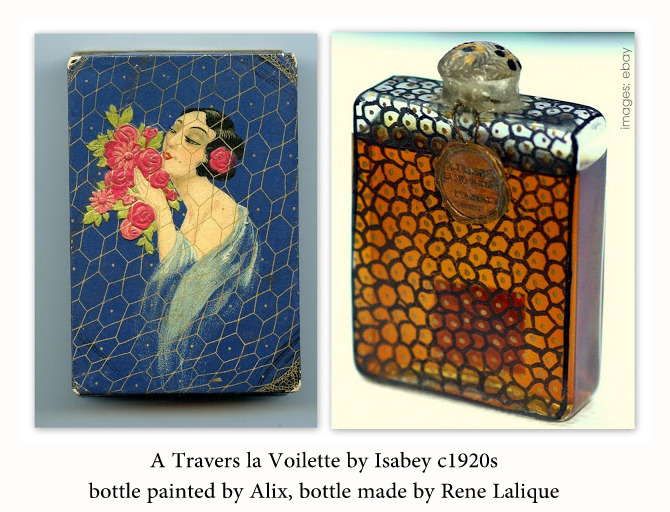 The square crystal bottle for A Travers la Voilette was manufactured by Rene Lalique and enameled by artist Alix. Its decoration was a simple stenciled flower and leaf pattern towards the bottom in gold and black enamel. 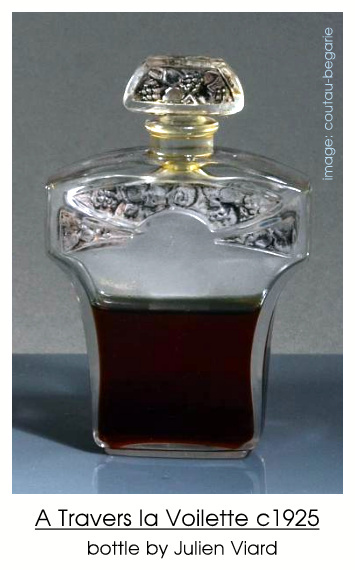 Another variation of this bottle's decoration features stylized black "scales" with gold enamel dots which imitates the veil theme on the box. Probably also painted by Alix. This bottle dates to the 1920s. Another bottle used for the perfume was design by Julien Viard. Bottle made up of pressed glass, molded of cubic rectangular section, its flared belly with molded decoration in reserves of gray patinated florets, its cap cabochon taking again the same decoration. Numbered. The perfume was still being sold in 1927.